Copyright: © 2018 Suganthan N, et al. This is an open access article distributed under the Creative Commons Attribution License, which permits unrestricted use, distribution, and reproduction in any medium, provided the original work is properly cited. 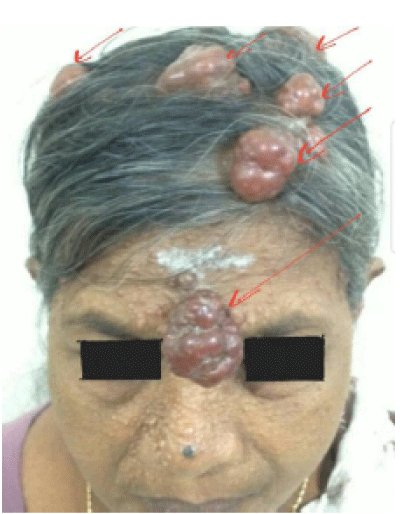 A 51-year-old women presented with asymptomatic multiple polypoidal nodules over scalp with simultaneous papularnodular skin eruptions involving nose, nasolabial folds and forehead for 40 years duration. Her daughter also noted to be having multiple papularnodular skin eruptions involving nose, nasolabial folds and forehead which raised curiosity of possible familial condition. 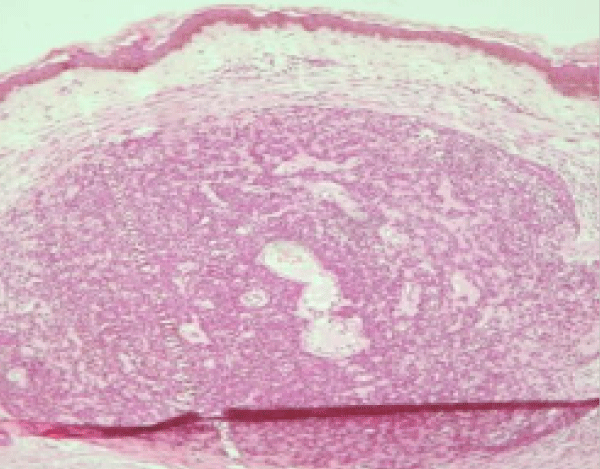 The punch biopsy of polypoidal nodule indicating histological evidence of spiradenoma was favour in diagnosis of Brook Spienger Syndrome. We report this case as this is a rare clinical entity. Brooke-Spiegler Syndrome is an autosomal dominantly inherited disorder characterized by coexistence of multiple skin adnexal tumors including spiradenomas, cylindromas and trichoepitheliomas. Only few cases of Brooke- Spiegler syndrome are reported in literature. We report a case history of 51-year-old female who presented with asymptomatic multiple polypoidal nodules over scalp with simultaneous papularnodular skin eruptions involving nose, nasolabial folds and forehead. Considering the clinical presentation and the histological evidence together supports “Brooke- Spiegler Syndrome” as the unifying diagnosis. A 55-year-old female presented with multiple asymptomatic slow growing skin nodules over her scalp for 15 years duration. She also had multiple papular non-tender skin eruptions over the nasal bridge and bilateral nasolabial folds since the age of 15. Her past medical history was insignificant for any seizure disorders in childhood however her own daughter who is now 21 years in age is also having multiple asymptomatic papular skin eruptions in nasal bridge and bilateral nasolabial folds ,the nose, the forehead and the upper lip since the age of 18. On examination, patient had multiple non-tender discrete soft skin coloured nodules measuring 3 cm × 3 cm distributed mainly over frontal, parietal and over the vertex of the scalp (Figure 1). Each nodule had a wide pedunculated base and they did not bleed on touch. She also had multiple rounded, skin – coloured, firm papules measuring 2 mm×8 mm in diameter located mainly on the nasolabial folds, the nose, the forehead and the upper lip. Her skin lesions were limited to the face and scalp. Rest of the systemic examination was unremarkable. Figure 1:Multiple non-tender discrete soft skin coloured nodules measuring 3cm × 3cm distributed mainly over frontal, parietal and over the vertex of the scalp and firm papules measuring 2-8mm in diameter located mainly on the nasolabial folds, the nose, the forehead and the upper lip. The punch biopsy of one of the nodules revealed intradermal well circumscribed lesion with asoloid cells; the stroma shows hyaline sclerosis and overlying epidermis appear normal (Figure 2). A final diagnosis of benign adnexal tumor suggestive spiradenoma was made. Figure 2: The punch biopsy of one of the nodules revealed intradermal well circumscribed lesion with asoloid cells; the stroma shows hyaline sclerosis and overlying epidermis appear normal. Spiradenoma is a rare form of skin appendage tumor and commonly located in scalp, the neck and the upper part of the body . Lesions usually manifest as 1cm diameter gray, pink, purple or blue solitary nodules, however our patient had fairly large nodules largest measuring 3×3 cm distributed over scalp. Though they can be painful in paroxysms, patient denied any sensory symptoms involving these nodules. Most often spiradenoma behaves as a benign skin adnexal tumor however there are few case reports on malignant spiradenomas in literature. Malignant spiradenomas can occur denovo but its occurrence in long standing unchanged cutaneous nodule with recent enlargement and ulceration forms the commonest presentation. There are reported cases of malignant breast spiradenoma with histological features showing carcinosarcomatous conversion . They can also have distant metastasis to regional lymph nodes, bone, lungs, brain and liver which in turn indicates poor prognosis and highlights the need for close follow up. Brook-Spiegler syndrome constitute occurrence of multiple spiradenomas together with multiple cylindromas and trichopitheliomas . Cylindromas are benign skin appendage tumors. The cellular origin of cylindromas remains unknown however both spiradenomas and cylindromas exhibit apocrin, eccrine, secretory and ductal features. Triochoepithelioma is described as a benign adnexal neoplasm and its familial nature is well established. The gene responsible for familial trichoepithelioma is located on band 9p21 . Trichoepitheliomas occurring in association with Brook-Spiegler syndrome is caused by mutations of the cylindomatosis oncogene (CYLD), which maps to 16q12q13  and it exhibit autosomal dominant inheritance pattern. Our patient presented with asymptomatic multiple large discrete polypoidal lumps over the scalp with numerous papularnodular skin eruptions over nose, nasolabial folds and upper lip clinically suggestive of multiple trichoepitheliomas and histological findings of biopsy of large scalp nodule compatible with spiradenoma collectively supports, Brook- Spiegler syndrome as a unifying diagnosis. Occurrence of relatively large polypoidal lumps with longstanding history in this patient warrants close follow up, for early detection of any malignant transformation.